Thailand, 27-30 November 2017 - In partnership with the Royal Thai Ministry of Agriculture and Cooperatives (MOAC) and its Royal Irrigation Department (RID), UNDP and GiZ organized a workshop and study tour to build practical skills in appraising projects and harnessing nature-based approaches to adaptation planning. Following a series of prior trainings on related topics, the two-day advanced technical workshop held in Bangkok on 27-28 November targeted over 20 planning officers and economists from every line department within the agricultural ministry. Using a combination of both classroom learning and group breakout discussions, workshop participants learned from three international and two local experts on how to both conduct and independently critique cost-benefit analyses. They also learned about measures to integrate water and land management into adaptation responses that could make agricultural-based livelihoods more resilient to future stresses from climate change such as increased drought or flash floods. Through cases studies of successful pilot measures for integrated water resource management already being implemented by a GiZ-programme on in Thailand with another ministry, MoAC officials better understood how valuing ecosystem services could be incorporated into future project appraisals and design. Most participants said the workshop was a great opportunity to learn more about the steps to conduct a CBA and how to apply various methodologies to adaptation planning. They underscored that the lectures will be beneficial in their work and that they have more knowledge. In 2018, MOAC intends to formulate more climate-resilient programmes linked to central budget submissions aligned to the updated sector strategy on climate change and the National Adaptation Plan, with support from the joint UNDP-FAO Integrating Agriculture in National Adaptation Plans Programme (NAP-Ag). At the end of the workshop, participants provided this feedback on their experience: “It really enhanced my existing knowledge of CBA, which I already use for project appraisal at RID. I’ve refreshed my knowledge and have a much clearer understanding of the concept and its application. If other agencies ask us for help in sharing about CBA in practice, I would be very pleased,” said a planning officer from the Royal Irrigation Department. Recognizing that classroom learning isn’t enough to fully appreciate the concepts, RID hosted the MOAC representatives to learn more from the practical experience of the “Yom Nan Water Management Project” covering a large area in Phitsanulok and Sukhothai provinces (summary report available here). Initiated to address flood and drought problems in the Yom Nan River Basin, which are directly affecting riparian agricultural communities, an extensive water and agricultural management project has been designed by RID and an integrated team of experts from across MOAC, taking ecosystem-based adaptation lessons to heart. The project, supported by UNDP, is also likely to be the first full-scale investment proposal being submitted by Thailand for consideration by the Green Climate Fund (GCF). Participants visited a number of project intervention sites, including Ban Bangkaew floodgate. According to the project director at RID, the project will develop a database and early warning system related to water and climate, renovate water-control buildings, and the build the adaptive capacity of farmers and fishermen. For example, under the project, the calendar for rice cultivation is being shifted to plant in April and harvest before flood season. Rice fields are then used to temporarily control water during the flooding periods. The water can be stored for future use in a retention pond, likened to a “monkey’s cheek” – a metaphor first coined by King Bhumibol Adulyadei of Thailand. This refers to monkeys’ habit of filling up their cheeks with excess food to save for a rainy day. 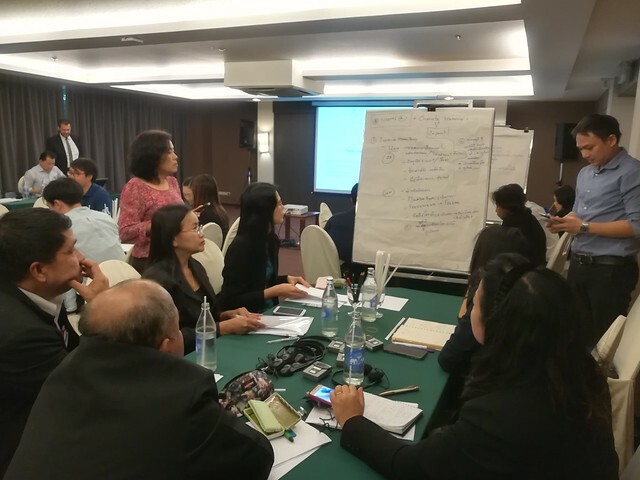 In addition to supporting the development of more robust future climate finance proposals in the sector, the workshop also aimed to build skills in tools necessary to prioritize investments and domestic budget resources for implementing the Thai National Adaptation Plan (NAP), in this critical climate-sensitive sector. But in the end, while integrating agriculture in National Adaptation Plans requires capacity building at the ministerial and sectorial levels, the end goal remains building more climate resilient lives and livelihoods for vulnerable communities. Learn more in the Thai language version on the Royal Irrigation Department websit (RID).